Detroit Tiger Stadium picture photo picture art print for sale of THE OLD BALLPARK. Old Detroit Tiger Stadium photo art picture photograph prints for sale of Detroit, Michigan. Old DETROIT TIGER STADIUM photo art photography pictures photo prints for sale. 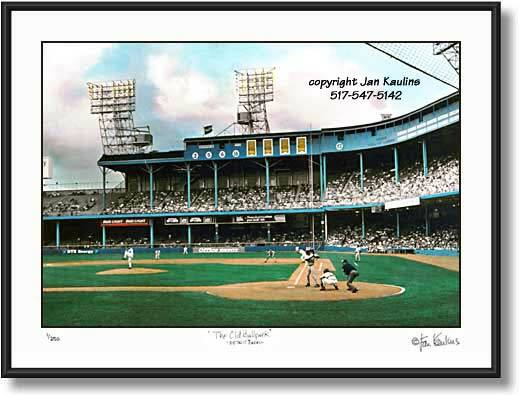 This historic old Detroit Tiger Baseball Stadium color picture photo print for sale is made from an original black and white hand-colored action photograph of a game at old Detroit Tiger Stadium. In this DETROIT TIGER STADIUM photograph picture we see Ken Griffey Jr. at bat during Detroit Tiger Stadium's final baseball season in 1999. In this historic City of Detroit picture photo of old Detroit Tigers Stadium, the view is towards 1st base down the right field line. We can see the retired players numbers and the World Championship banners above the right field upper deck of this Detroit Michigan Detroit Tiger Stadium picture photo Fine-Art print. The fans in the stands in this Detroit Tiger Stadium picture photo know that this will be the last year to see Detroit Tiger baseball played at The Old Ballpark at Michigan and Trumbull in downtown Detroit, Michigan. This Detroit Tiger Stadium interior baseball game action photograph is a picture that captures the spirit of the old Detroit landmark, Detroit Tiger Stadium, where Major League baseball was played from 1912 to 1999.